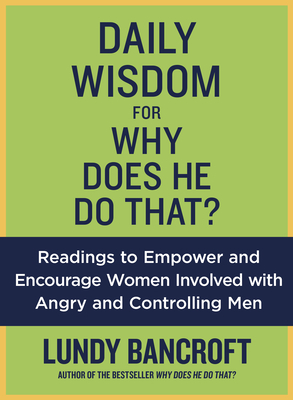 Lundy Bancroft expands on his bestseller Why Does He Do That? in this daily guide that empowers women who are suffering in abusive relationships. Even if you’ve read Why Does He Do That?, it may be hard to see the truth of what is happening to you. You may feel overwhelmed by confusion, loss, and fear, and find yourself looking away from the truth and falling back into traumatic patterns. What you need is something that is there for you every day—to help you make a long series of little changes that will ultimately add up to a big one. Like a constant friend, this collection of meditations is a source of strength and reassurance designed to speak to women like you, women in relationships with angry and controlling men. It is a tool you can use to learn how to value and respect yourself—even when your partner makes it very clear that he does not. With seven themes designed to encourage and inspire, Daily Wisdom for Why Does He Do That? will help you digest what is happening one day at a time, so that you can gain clarity, safety, and freedom. You will see the truth in your destructive relationship. You and your children will survive. And—with these encouragements—even tomorrow will be a better day than today. Praise for Why Does He Do That?